Here are all the Tech Deals of the Amazon Prime Day 2018! 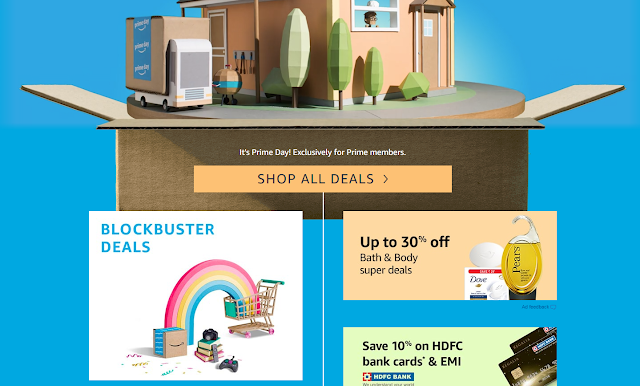 So Amazon is starting it's Prime Day bonanza offers by introducing a plethora of offers to begin with their "Amazon Prime Day 2018" exclusively for Prime members. Now's your chance to become an Amazon Prime Member to extract all the benefits in their Prime Day 2018. Today the company is planning to begin with over 200 exclusive product launches across all genres which includes Oneplus 6 Red edition launch, Intel's 8th Generation gaming laptops, Nestlé NesPlus breakfast cereals, Season’s Iconic Styles by Marks & Spencer, Bosch Microwave oven, ASICS shoes, LEGO Taj Mahal & much more exclusively to it's Prime members. - OnePlus 6 Red Edition available in the 8GB RAM + 128GB Memory variant for INR 39,999; extra up to INR 2000 off on exchange. - Moto E5 Plus is available for INR 11,999 with extra INR 1000 off on exchange. - Members who buy a TCL 139.7 cm (55 inches) 4K Smart TV get a TCL 81.28 cm (32 inches) TV for INR 1. - Activity Tracker with BP & Heart Rate monitor from GOQii, with personal coaching. - Best-ever savings on Amazon Echo including a 45% discount on Echo Dot. Watch out for a flash sale on Echo Spot at 3 PM (IST) today. Also, save big on the latest smart home products such as Alexa enabled smart plugs, lights, cameras & more. - Flat 25% off on the bestselling Kindle Paperwhite WiFi, 20% discount on the All-New Kindle, best discount of 15% on the Kindle Oasis. - Best-ever savings on Fire TV with Amazon Pay discount of up to 100% cashback when purchased along with select TV brands. Or avail INR 300 cashback via Amazon Pay when bought with any TV during Prime Day. 30% discount on Fire TV Stick only. - Prime members who use at least four skills will get INR 200 Amazon Pay Cashback. Alexa has over 15,000 skills. To explore a few ask, “Alexa, help me relax,” “Alexa, let’s play a game” or “Alexa, I want to meditate.” Skills excluded from the offer – Smart home, News & Flash briefing, Music (Prime Music, Saavn, and TuneIn). View complete T&Cs at www.amazon.in/alexaoffers. - Alexa enabled devices Eufy and Jabra to offer a minimum INR 1500 discount for purchases made on Prime Day. Eufy to offer 40% discount, Jabra Elite 65T will be available at 11% discount and Jabra Elite 65T Active at 10% discount. -Prime members get 50% back through Kindle Credits on purchasing of eBooks on Prime day, subject to max INR 100 worth of credits per customer. - Subscription available for (INR (2388) 1388) only for Prime members on Prime Day. - Huawei: First time on discount, up to INR 5,000 off on Huawei smartphones; no-cost EMI options up to 12 months available. - Moto G6 starting INR 13,999; extra up to INR 2,000 off on exchange; Moto E5 Plus (3GB + 32 GB) - INR12, 999 for INR 11,999; extra up to INR 1,000 off on exchange. - Up to INR 3000 off on all Vivo smartphones; extra up to INR 6,000 off on the exchange. - Up to INR 4000 off on all OPPO smartphones; extra up to INR 3,000 off on the exchange. - Redmi Y2: Prime-only flash sales at 1 pm on 16th and 12 noon on 17th July. - 10.Or smartphones start at INR 4,999. - Mi 10,000 mAH Power bank for 1199 INR 899. - Flat 50% off on select headphones from Bose and Sennheiser. - Select deals on DSLRs from Canon and Nikon. - Up to 55% off on hard drives from Seagate and WD. - Select deals on i3 and i5 laptops from Dell, HP, and Lenovo. - Premium TV (including OLED) offers from LG, Sony, and TCL. - Up to 50% off on extension cords. - Minimum INR 2,000 off on latest gaming consoles. - Up to 40% off latest games and accessories. - Up to 70% off on Kaspersky Antivirus Software. - Minimum 25% off on Office and Tally. - 50% off on select headphones from Bose and Sennheiser, Up to 40% off on air conditioners, Minimum 60% off on UCB, Lee and top fashion brands, Up to 45% off on toys and more Biggest discounts of the year on Amazon Devices including the lowest price ever on Amazon Echo Dot. 10% cashback on loading Amazon Pay balance 10% instant discount on purchases made through HDFC Bank credit and debit cards, Up to INR 10,000 cashback on purchases above INR 50,000 made through HDFC Bank cards. Additionally Prime users in Delhi NCR, Bengaluru, Hyderabad, and Mumbai can enjoy ultra-fast 2-hour delivery.